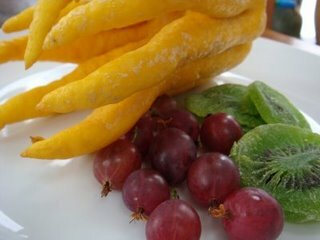 This is the Buddha’s Hand, Red Gooseberries and the dried, candied kiwi. The Gooseberries are quickly disappearing as the 4-yo and I down them. Even though most experts recommend baking with Gooseberries rather than eating them raw (because they tend to be quite tart), these berries are sweet enough to munch on right out of the container. The flavor is reminiscent of both blueberries and kiwi to me (but this is probably because of the texture and the little seeds they have). The interior is soft, almost mushy, and a bit mealy. 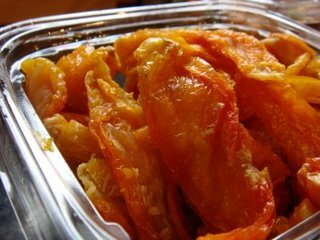 These sun-dried yellow tomatoes are fresh, plump and have an amazing color. The price was great and they are super sweet and succulent. I think I’ll throw these babies in some pasta dishes over the next week or so. Lastly, this is the “Indian Summer Wasabi Mix”. 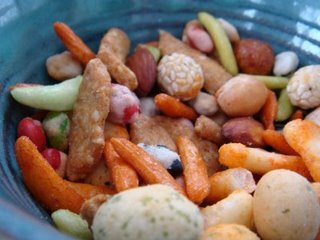 It’s a combination of wasabi peas and beans, various types of rice crackers and several types of sesame stix and balls. The Husband is a huge wasabi cracker/pea fan, so I knew he would appreciate these. Plus… the mix was pretty. 🙂 The container is about 2/3 of the way gone by this point. It’s a nice mix… sufficient spice and salt without being overwhelming. A definite hit.